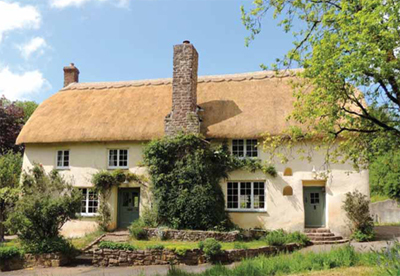 East Forde Farmhouse is a Grade II listed Devon property dating back to the late 17th/early 18th century. The house has been re-thatched and re-decorated throughout with Farrow & Ball conservation colours and has lots of good features. The open-plan kitchen is an excellent family space with a marble shelved walk-in larder while the entrance hall has flagstone flooring. The oak-floored sitting room has a fine inglenook fireplace and doors leading out to the patio and walled garden. There are four double bedrooms and a Victorian-style bathroom with a roll-top bath and shower. The Cider barn is a two-bedroom barn conversion with a large open-plan sitting room, while The Shippon is a suite of workshop and work spaces. The Studio provides a superior office space with work stations for up to ten staff with a mezzanine for storage. The grounds include a stunning walled garden, a hay barn, garages, sheds and a tree house, and an informal wildflower garden. Poultry houses with runs sit beside the stream which flows through the land. Beyond is a traditional cider orchard which provides useful grazing. Lot 1 is the principal property buildings and grounds and Lot 2 comprises two traditional meadows. As a whole the property comes to around 13 acres. East Forde Farmhouse is located in mid Devon around 20 miles from Exeter and a mile south of Cheriton Fitzpaine which has a primary school, pub, post office shop and a church, and just five minutes walk from a great farm shop. Tiverton is just nine miles. The guide price is £950,000. For further information please contact Savills on 01392 455 700 or visit the house on their website.